B0883. John R. Bennett. 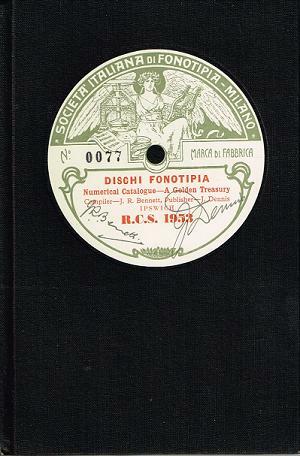 Dischi Fonotipia, A Golden Treasury. UK, The Record Collector Shop, Original 1953 Edition. 88pp. Serially Numbered 1st Ed., #827, Limited to 1000 copies. Exceedingly Rare First Edition, featuring facsimile Fonotipia Label on cover. Excellent copy has occasional check marks, but no underlining. "John Reginald Bennett’s compendium, VOICES OF THE PAST, is a major reference to English, Italian, French, German, and Russian vocal recordings between 1898 and 1925. These volumes, encompassing more than 25,000 vocal recordings.